Point2Point is a stand-alone application that calculates the linear distance between two related sets of points. Understanding the geographic relationships between store and customer locations can provide a valuable mechanism for determining store patronage distance decay factors, for delineating the primary trade area, and for determining the nth closest customers to a particular store location. Commonly this evaluation is performed by mapping both the store and customer locations, and measuring the distance to each customer for a given store. The process can be time consuming, and to-date, there was no easy way to rapidly evaluate proximity relationships between two different point data sets. 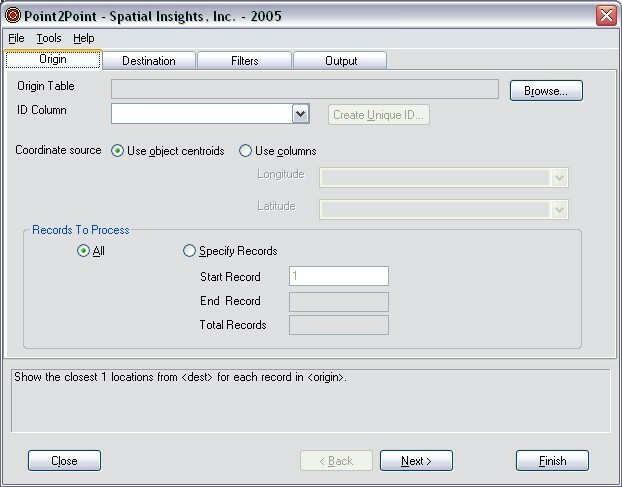 Spatial Insights Point2Point application was developed in response to client driven projects that required the determination of geographic relationships between stores and customer locations. Using Point2Point, users can rapidly determine which customers fall within a specified distance to a store, or model the distance from the store to all customers. Point2Point also ranks each destination location according to its distance from the store, and calculates a cumulative percentile to facilitate primary trade area definition and analyses. · New Version of Point2Point works directly with your georeferenced .DBF files and MapInfo Tab files. The output is compatible with all desktop mapping and GIS systems. Required geocoded data in latitude/longitude decimal degrees. · Specify your "Origin" and "Destination" files, filter results based on "Nth" closest or radius from origin.